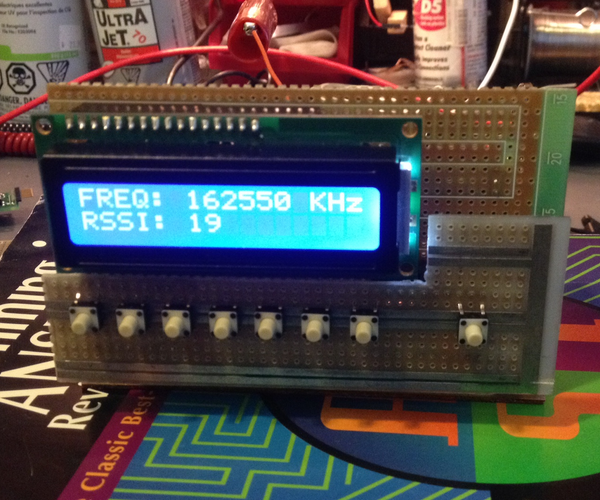 Right now on the bench the PIC powers up, resets and powers up the radio, then tunes the radio via I2C to 162.55MHz. It finishes up by reading back the status and then dumps the Tuned Frequency and RSSI ( Received Signal Strength Indicator ) on to the LCD… then off to infinite loop land. In the next few days I plan on having my seven buttons for “quick tune” to the common frequencies (.40, 425, .45, etc..) and one additional monitor/standby switch. My radio will normally be silent and once it receives a weather alert it will un-mute the speaker and alert the LCD. The Standby/Monitor button will reset my alert. This entry was posted on Thursday, February 6th, 2014 at 7:00 pm	and is filed under PIC. You can follow any responses to this entry through the RSS 2.0 feed. You can skip to the end and leave a response. Pinging is currently not allowed.